The Friday 56 is hosted by Freda’s Voice, it involves sharing a small excerpt from the book you are currently reading every Friday and then posting a link to the linky hosted on her site. 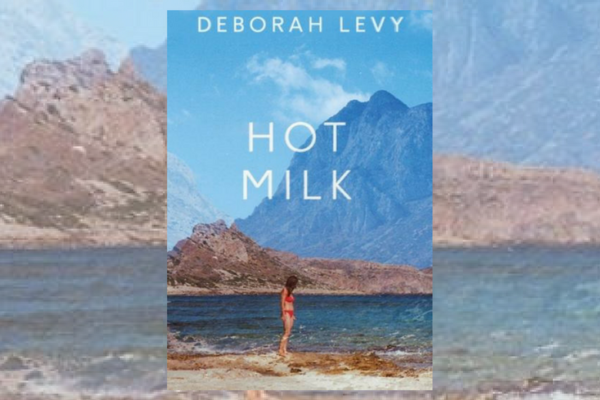 This week I chose Hot Milk by Deborah Levy. I am just over halfway through Hot Milk and the whole book so far has made me feel like I have entered another person’s dream. It is disorientating and unfamiliar but I absolutely cannot put it down. The novel is set in a beach town in Spain, the main character is half Greek and half English. It is a twisted coming of age tale, an exploration of truth and identity. The wandering prose and general oddness of the characters are unsettling and yet there’s somehow some familiarity, enough to like the main character, Sofia, and her angry relationship with seamstress Ingrid Bauer. Who incidentally has a partner called Matthew, but still stitches a shirt for Sofia that may or may not have the word beloved on it. Then there is the student that works in the medical hut, Juan, who Sofia might have feelings for. But if the feelings are there, they are confused and constantly undermined by Sofia’s mother, Rose’s wishes. The sentence I chose for Friday 56 sums up what the book seems to be about, at least up to the part I have read. Sofia and Rose are not on holiday in Spain, they are here to find a cure for Rose’s mysterious paralysis, that surely must be hypochondria developed to keep her daughter at her side. They are in Spain to find answers from the mysterious Mr Gomez who may be a Quack, with his strange questions and practices. He runs the clinic that is housed in a white marble dome and there is no mention of other patients. There is an underlying tone of menace throughout the novel. The clinic walls are graffitied, but Gomez lies to Sofia about the words that were sprayed onto its white exterior. Ingrid seems to gather Sofia closer even as she pushes her away and the jellyfish, called Medusas in Spanish, provide a current of tension and pain throughout the book. I am excited to find out what happens to Sofia and the rest of the cast in this wonderfully opaque novel. That synopsis sure sounds different. I find that when books unsettle me, the author has gotten their point across. Sounds good to me! Have a great week ahead!